If you do business in Carrington... you are probably dependent upon the growth and prosperity of Carrington to make your business more profitable. The Chamber is the organization dealing with the concerns in Carrington and working for continued growth in the community. 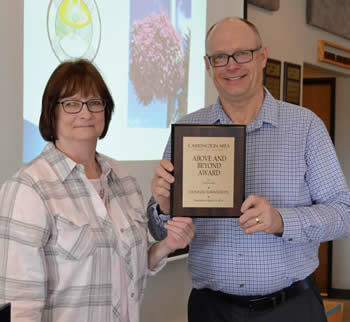 Chamber Executive Director, Laurie Dietz(left) presented an Above and Beyond Award plaque to Dennis Swanson, Chamber Board member, of Wholesale Ag Products at the recent Chamber Annual Meeting. Swanson, has been instrumental in the start up of the Carrington Garden Club and many beautification projects in the Carrington community - such as the flowering baskets (photo in background). Dennis has given countless volunteer hours on this endeavor. If you are a small business... you realize the importance of making business contacts in the community. A majority of Chamber members are small businesses. By working together through the Chamber, they bring more businesses, more residents, more tourists, and more customers to Carrington. If you are too busy to be involved... you can benefit from the efforts of the Chamber to promote and ensure the growth of the community. Even if your budget is tight... you will find Chamber membership will provide you with a high return on your investment. Membership in the Carrington Area Chamber of Commerce means exposure, referrals, and assistance in your business. Community Development... the economic development of Carrington is one of the main concerns of the Chamber; we hope to facilitate growth of existing companies and new businesses.